At the present time, the multinational Russian Orthodox Church is going through a period of restructuring, known as ‘Metropolitanisation’. Thus, inside the huge Russian Federation extremely large dioceses, sometimes covering territories with nominal Orthodox populations of perhaps two to four million and the size of large Western European countries like France, are being divided. Each is becoming a Metropolia, typically with four or five dioceses of some 100 parishes each, led by a Metropolitan in the centre. The aim is to bring the bishops closer to the people. As a result the Church already has nearly 300 bishops, over twice as many as in 1917, as well as hundreds more potential candidates. In this way the hierarchy of the Russian Orthodox Church is striving to meet its responsibilities towards the faithful. In Moscow in May 2012 His Holiness Patriarch Kyrill made it clear to us that he would like, with time, to see this process extended worldwide to countries outside the canonical Russian Orthodox territory (the territories of the former Russian Empire, apart from Georgia and Poland, plus China and Japan). In other words, we are talking about the territory of the Russian Orthodox Church Outside Russia (ROCOR). This would create Metropolias in the large, continental areas of Western Europe, North America, Latin America, Australasia and perhaps also Alaska, formerly called ‘Russian America’. As was made clear again at the London Conference of October 2012, all Russian Orthodox parishes and monasteries in Western Europe will eventually come under ROCOR administration. (Of five possible Metropolias outside Russia, we would think that perhaps South America and Alaska might initially come under administration from Moscow, whereas North America, Western Europe and Australasia would come under ROCOR). As we suggested as long ago as 1986 and as was published later, such a Russian Orthodox Metropolia of Western Europe, probably centred in Paris and with a seminary, could be divided into six dioceses, three Latin-speaking and three Germanic-speaking, and have at least seven bishops. In 2003 Patriarch Alexis II publicly announced this long-awaited hope for a Metropolia in Europe, centred in Paris, as proposed by the then Metropolitan Kyrill. The six dioceses of such a Metropolia of perhaps 400 churches would be: the French Lands – France, French Switzerland, southern Belgium and Luxembourg (72 million and perhaps 70 churches); Italy, Italian-speaking Switzerland and Malta (62 million and perhaps 60 churches); Iberia – Spain and Portugal (58 million and perhaps 60 churches); the German and Dutch Lands – Germany, Austria, most of Switzerland, the Netherlands and Flemish Belgium (118 million and perhaps 120 churches and therefore two bishops); the British Isles and Ireland (68 million and perhaps 70 churches); Scandinavia – Sweden, Denmark, Norway and Iceland (20 million and perhaps 20 churches; a small number of parishes but a huge territory for one bishop). In this way, with each of the 400 parishes covering on average a catchment area of about 50 miles (80km) in diameter, about 2,000 square miles (about 5,000 sq km) in area, most of the territory of Western Europe would be covered. We do not as yet have this multinational Metropolia of 400 parishes to cover a population of just under 400 million. However, the British Isles and Ireland, with a population of 68 million, would form the third largest of the six dioceses in it. As we do not build top-down in the Orthodox Church, but build up infrastructure pastorally, no Metropolia can exist without the grassroots. And it is from the grassroots that we could at least look to the possible future and how, both nationally and locally, the British Isles and Ireland and then England could fit into the Patriarchal vision of a larger local diocese of such a Metropolia. Generally, Scotland, Wales and even Ireland, with a total population of just under 15 million, have lower levels of Orthodox population than England. Nevertheless, we would think of Scotland as having parishes in Glasgow, Edinburgh, Aberdeen, Dundee, Inverness and a chapel or monastic pilgrimage centre on Iona. We would conceive of Ireland as having parishes perhaps in Dublin, Belfast, Cork, Derry, Waterford and Galway. We would think of Wales as having parishes in Cardiff, Swansea, Aberystwyth and Bangor. This would make a total of 16 churches. Obviously locations would depend on local choices; the above are only suggestions. Let us now look in detail at England, which, though small, has nearly 80% of the island population. 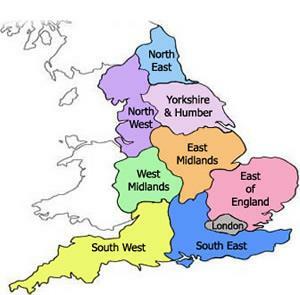 With an area of just over 50,000 square miles (130,000 sq km) and densely-populated with 53 million people, an average of just over one million per 1,000 square miles, England is divided into nine regions, as shown above. Each has different concentrations of Russian Orthodox inhabitants, but London above all and then the two regions nearest London have the largest concentrations. We would suggest that there should generally be one church, of varying size, for each catchment area of around one million people, given that the local Russian Orthodox population, however irregularly practising, is on average about one in a thousand. This would create potential parishes of around 1,000, although numbers attending on an average Sunday might only be 100-200. Obviously, the concentration of Russian Orthodox population varies immensely, being highest in London, average in the towns of the South and East, and lowest in the rural areas of the North and the West. Therefore larger churches in Greater London and other very large cities would have very small catchment areas of perhaps only 50 square miles, whereas in the provinces smaller churches might cover between 500 and 2,500 square miles, on average about 1,500 square miles, depending on how rural the surrounding area is. As can be seen below, there are exactly fifty cities and towns in England with populations of over 100,000. Logically, it is most of these centres of population which should be targeted to establish churches. It is true that a few of these cities and towns already have permanent, public-access, multinational Russian Orthodox churches, although four of these have been established only in very recent years. Notably, this is the case in London, although the parishes there are totally insufficient in number, with only two, one medium and one small, for an urban area population of over 11,000,000. Outside London a few cities and towns have become relatively better equipped – for example, Manchester, Liverpool/Birkenhead, Oxford and Colchester, although there is more to be done even here. In general, we would suggest that where towns of 100,000 + are near one another, only one permanent church is necessary. For example, from the above list: Sunderland is next to Newcastle; Blackburn and Blackpool are next to Preston; Bolton, Oldham and Stockport are next to Manchester; Rotherham is next to Sheffield; Huddersfield and Bradford are next to Leeds; St Helens is next to Liverpool; Derby is next to Nottingham; Wolverhampton is next to Birmingham; Ipswich, Chelmsford and Southend-on-Sea are next to Colchester; Reading is near Oxford; Basildon, Watford, Woking-Byfleet and Slough would come under London urban area parishes; Portsmouth is next to Southampton, Bournemouth is next to Poole. Only one of these towns need have a church. Nevertheless, if we were able to plan to provide cover for most of England with permanent, public-access, multinational churches, faithful to the Russian Orthodox Church and calendar, then we would need: in London nine more churches; in Birmingham three churches; in Liverpool two more churches (as there is already one in nearby Birkenhead); one church in each of Sheffield, Leeds, Bristol, Leicester, Hull, Coventry, Nottingham, Stoke, Plymouth, Southampton, Newcastle, Preston, Norwich, Bournemouth, Swindon, Middlesbrough, Peterborough, York, Brighton, Gloucester, Luton (St Albans) and Northampton. According to the above, we are suggesting the obtaining or building of no fewer than 36 more churches, in addition to the five already established. The aim of this path is to ensure that the Russian Orthodox Church and its liturgical calendar are permanently accessible to the interested population in England, in English and Slavonic. However, even such a minimal schema of establishing a church, whether large or small according to local needs, for about every one million people in the main local centres of population, so that most should not have to travel more than 25 miles in a straight line (so in fact further, as one cannot travel in straight lines) to get to church, means that areas with several towns, but all with populations fewer than 100,000 and relatively more rural areas have been omitted. For example, even in the above schema there is, surprisingly, no church in Kent, the south-west outside Plymouth, Herefordshire, Worcestershire, Shropshire, Lincolnshire, Northumberland and Cumbria. Therefore, it would also seem sensible to hope to establish 13 other churches or monastic pilgrimage centres, perhaps in: Canterbury, Exeter, Barnstaple, Truro, Hereford, Worcester, Shrewsbury, Lincoln, Lindisfarne, Carlisle, as well as in Newport in the Isle of Wight, in Douglas in the Isle of Man and in the Channel Islands. This would mean a total of 54 churches in England and altogether 70 churches for the Russian Orthodox portion of the 68 million in the British Isles and Ireland. What of the Patriarchal vision locally? The East of England is in area the second largest of the nine English regions. It covers the six counties of Norfolk, Suffolk, Essex, Cambridgeshire, Bedfordshire and Hertfordshire. The regional population at the 2011 census was 5,847,000, 11% of the total population of England, making this an ‘average’ region. The largest towns are Luton, Basildon, Peterborough, Southend-on-Sea, Norwich, Ipswich, Cambridge, Chelmsford and Colchester. This region has an average number of Russian Orthodox, because it is near London and also because it faces Eastern Europe, especially the Baltic States, from where many have come. Therefore, with a population touching six million, though with many in Essex and Hertfordshire living in the Greater London urban area, the region should have five church centres, of which today only one exists. At present the East of England Orthodox Church (EEOC – a charitable trust) is set up in Colchester (population: 104,390). This trust is the owner of the only permanent, Russian-speaking and English-speaking church in the region which is in Colchester. At present this covers not only its natural catchment area of Essex outside London and Suffolk, but much of the region and even beyond. This natural catchment area of some one and a half million includes Southend-on-Sea (174,300), Ipswich (133,384), where we are helping a new Russian Orthodox mission, Chelmsford (120,000) and several smaller towns like Clacton, near where there is now also a mission, Braintree, Witham, Sudbury and Felixstowe, from where this whole East of England mission began. The local saints are: St Helen, St Botolph, St Cedd, St Osyth, St Edmund. 1. Norwich (173,300). The natural catchment area of about one million covers most of Norfolk and North Suffolk, includes Great Yarmouth (68,317), Lowestoft (64,358), Thetford (21,588) and smaller towns. This area has been our priority for several years, so far without success, with parishioners travelling to us from Norwich every weekend. Local saints: St Walstan, St Edmund, St Felix. Given the very many medieval churches and dedications in this city, perhaps the church could be dedicated to All Saints. 2. Peterborough (144,800). Although just inside Cambridgeshire, the natural catchment area covers towns outside the East of England region, including Boston (58,124), King’s Lynn (42,800), Spalding (28,722) and Wisbech (20,200). Although this catchment area is small, it has a high proportion of Russian Orthodox immigrants from Eastern Europe and especially the Baltic States and it must be a priority. Local saints: St Peter, St Paul, St Guthlac, St Huna, St Wendreda, Martyrs of Crowland. Given the city’s name, the church should be dedicated to Sts Peter and Paul. 3. St Albans (58,000). Although this is a small town near the much larger Watford and Luton, it would seem only right for historic reasons that a church centre be established precisely here, in the city of the first martyr of the British Isles and dedicated to him. The natural catchment area of some one and a half million covers most of Bedfordshire to the north, Hertfordshire outside London to the south and even the west of Essex. Just to the north of London, it is surrounded by other towns, both larger and smaller. These include: Luton (179,700), Watford (115,499), Harlow (94,365), Stevenage (84,651), Hemel Hempstead (81,143), Bedford (79,190) and several smaller towns. (Watford and Hemel Hempstead are officially included in the Greater London urban area). Local saint: St Alban. The church should be dedicated to St Alban and built in a Roman style and roofed with pantiles, as was the church in Silchester. 4. Cambridge (123,900). The catchment area includes smaller towns in Cambridgeshire, west Suffolk and north-west Essex like Bury St Edmunds (35,015), Haverhill (25,000), Huntingdon (19,830), Newmarket, Saffron Walden and Ely. Although this is a smaller catchment area, it is important because of the very high numbers of Russians at the University of Cambridge. (There are over 1,000 members of the Cambridge Russian Club and over 200 children at the Russian School). Local saints: St Audrey, St Neot, St Ives, St Pandwyna. Given the University here, perhaps the church could be dedicated to the Three Hierarchs. Colchester and these four towns actually form a cross drawn over the East of England. It is true that there are already other Orthodox groups and missions in the East of England, either using temporary/Anglican premises or else domestic chapels. However, most of these are not Russian Orthodox or exclude those who live by the Church calendar, and all generally cater for only one nationality or national sub-group, for instance, Greek, Romanian or ex-Anglican. In any case, none is permanent and public-access and caters for the multinational, Russian-speaking and English-speaking Russian Orthodox Tradition and calendar. However, all of these chapels and structures play their role too in regional Orthodox life, by looking after individual national groups, whether larger groups from Eastern Europe or small convert chapels with ex-Anglicans. If some would like, on a purely voluntary basis, to join in the above scheme for a local Orthodoxy, all the time remaining in their Mother Churches, obviously that would be welcome. As an example of a diocese of the future Metropolia, we have taken the British Isles and Ireland, but have focused on that part of the diocese where most Russian Orthodox are concentrated – England. From here we have focused on one region, as a kind of case study – the East of England. We have suggested that in England regional church centres should be established to cover about every one million people, meaning that ideally 54 churches should be established if the needs of the multinational Russian Orthodox population are to be met. At present there are only five such churches – only about one tenth of our initial work has been done. The fact that we can even discuss such a vision shows, however, a remarkable shift from even a few years ago, when such a thing would have been unimaginable. Of course, these are still abstract propositions, set out only to stimulate thought. In reality, all will depend on the existence of this Metropolia, its infrastructure and suitable personnel, and also on where locally the multinational Russian Orthodox population is concentrated and on its needs, abilities and willingness, both financial ability and, above all, the human willingness to make sacrifices for the Church. We need adequate infrastructure, not only Church buildings, but also Church halls and rooms with toilets, kitchen and car parking, accommodation for clergy and choir directors and investment to provide salaries; but above all, we need people who have faith and want churches. Some will dismiss all the above suggestions for a Western European Metropolia as fantasy. But given that many large towns and cities in Western Europe already have churches, some of these churches even built in the 19th century, or at least communities, we are talking of perhaps one billion euros to establish this Metropolia of 400 churches. This is an impossibly huge sum for us, but a small sum for a Russian oligarch – for example. Churches come into being through the grace of the Holy Spirit inspiring human motivation, faith. It is true that if there is no faith to be inspired, then there is no hope, for hope is always the result of faith. It is true that all ‘plans’ are therefore only abstract. And realities can often turn out to be very different from our hopes, which have to be blessed in order to become reality. As ever: man proposes, but God disposes. This entry was posted in Uncategorized on April 29, 2013 by oeadmin. What Can Each Western European Land and People Bring to the Church? Finland learns Orthodoxy from neighbouring Russian Karelia and its saints like St Tryphon of Pechenga, Enlightener of Lappland (+ 1583). Poland learns its Orthodoxy from Mieszko I, baptized from Moravia in 966, and today learns from Belarus, the Ukraine and its native Lemko Carpatho-Russians. Slovakia learns its Orthodoxy from Sts Cyril and St Methodius, as well as from the Carpatho-Russians, both native and in neighbouring Transcarpathia. The Czech Lands learn from the glorious heritage of St Rastislav and Sts Cyril and Methodius in Moravia, St Ludmila and St Viacheslav in Prague, and learn from the struggles of Jan Hus in Bohemia. Hungary learns from the ancient heritage of its first Christians, come from New Rome with Bishop Hierotheos in c. 950, as well as from its Orthodox neighbours. Slovenia and Croatia learn from the first Slav missions of Sts Cyril and Methodius and their disciples. But what of the Western European lands, which, although they have a glorious but distant Orthodox past, have no Orthodox neighbours and so have to learn from new immigrant populations? What can they bring? The German Lands, Germany, Austria and most of Switzerland, can bring order and discipline. It is no coincidence that the first liturgical book translated into German was the Typicon. The French Lands, France, southern Belgium and eastern Switzerland, can bring the contemplation of God, the philosophy of faith. England and the Celtic Lands, Ireland, Scotland and Wales, can bring asceticism. It is no coincidence that the first liturgical book translated into English was the Lenten Triodion. Italy, that storehouse of Church relics, can bring the sense of Church history as the historic centre of Orthodoxy in the West. Spain and Portugal can bring their sense of beauty, ritual and vestments. The Dutch Lands, the Netherlands, Flanders and Luxembourg, can bring co-operation and co-ordination. Scandinavia, Sweden, Denmark, Norway and Iceland, can bring efficiency and practical effectiveness. If a Russian Orthodox Metropolia is to come into existence in Western Europe, we can then suggest how each of its lands and peoples can contribute their history from the first millennium and also their qualities as they developed in the second millennium. This entry was posted in Europe, Orthodox Restoration, Orthodox Unity, Russian Church, The Diaspora, The Future and tagged metropolia, western Europe on April 25, 2013 by Father Andrew. 1. Thou shalt have no other Gods but me. 2. Thou shalt not make for thyself any idol, nor bow down to it or worship it. 3. Thou shalt not take the name of the Lord thy God in vain. 4. Thou shalt remember the Sabbath day, to keep it holy. 5. Honour thy father and thy mother. 6. Thou shalt not murder. 7. Thou shalt not commit adultery. 8. Thou shalt not steal. 9. Thou shalt not bear false witness against thy neighbour. 10. Thou shalt not covet thy neighbour’s goods. During the first millennium after the birth of Christ, Western Europe was gradually Christianised, steadily submitting to the Ten Commandments in their natural order, from first to tenth. The Commandments were brought to it by the Church from Jerusalem, centred in Her Capital of New Rome (later called Constantinople), its double-headed eagle uniting east and west, Asia and Europe. However, Western paganism, formed by a complex mixture of pagan Romanism and pagan Germanism, began to take over Western Europe. This process took place in an ever accelerating way, so that in the ten centuries of the second millennium after the birth of Christ, Western Europe rejected each of these Commandments in reverse order, in this way reversing its Christianisation. This process took place in reverse order because the last Commandment to have been implemented had had the least time to become rooted in Western European society. Therefore, it was challenged and overturned more easily than the earlier Commandments which were better rooted. Thus, throughout the ten centuries of this second millennium, each Commandment was rejected in turn. In the eleventh century, the covetous Crusades in the Iberian Peninsula, in Sicily, England and then the Middle East and the Holy Land, marked the systematic and institutional beginning of imperialist greed and colonisation, with Western Europe covetously ravaging and pillaging its neighbours. In the twelfth century, filioquists bore false witness, asserting that the Church had omitted the filioque from the Creed! In the thirteenth century, in 1204 the Christian Capital of New Rome was looted, its shrines, relics and artefacts stolen as were many other Christian towns and cities. In the fourteenth century, the ‘Church’ of Western Europe committed adultery with State values, its vestigial Christianity being made subject to a State-like authority, so becoming a ‘Church-State’. In the fifteenth century, Western Europe began its murder of the peoples of the New World in unspeakable genocides, thus bringing them ‘Western civilisation’, ‘freedom and democracy’. In the sixteenth century, Western Europe dishonoured its father and mother by rejecting many of the remaining vestiges of the Orthodox Faith by falling into Protestantism. In the seventeenth century the Western world dishonoured holiness through its iconoclasm. In the eighteenth century, the Western Enlightenment took God’s name in vain, rejecting the Revelation of God the Holy Trinity, preaching man-hating deism and then atheism in violent wars and revolutions. In the nineteenth century, the ethnocentric Western world made an idol of itself, idolising its newly acquired knowledge of the fallen world (‘science’) in a cruel industrial revolution, idolising its all-limiting rationalism in a multitude of theories that despised God and exploited man. In the twentieth century, the Western world rejected God and instead made gods of everything, inventing every ism, so beginning its suicide in World Wars and giving itself the ability to destroy every living thing on the Earth many times over. If, one by one, the Ten Commandments were rejected in the Western world, century by century during the second millennium, what then can be said of the twenty-first century, of the third millennium? Only this – that the Western world is living on borrowed time. This entry was posted in Apostasy, Atheism, Constantinople, Europe, Filioque, Imperialism, Schism, The Future, The Middle East, The West and tagged History. Second Millennium on April 25, 2013 by Father Andrew. Of course, none of this true. In reality, to paraphrase Dr Johnson (1709-84), religion, and not patriotism, is ‘the last refuge of the scoundrel’. Scoundrels do not justify their hatred, envy, malice, cruelty and lust for wealth, territory and power by announcing truthfully that they are hateful, envious, malicious, cruel and lustful for wealth, territory and power, they camouflage it behind the noblest human instincts. Religion, the noblest, is therefore their flag, their best excuse, although ‘patriotism’ or ‘freedom and democracy’ will do, whenever atheistic and secularist societies want to justify their evil aggression and massacres. However, interestingly, in the Gospels Christ does not ask if on His return, He will find religion on earth, rather He asks if He will ‘find faith on earth’ (Lk 18, 8). For religion means a humanised, institutionalised, thisworldly system, adapted to the demands of states. It is a State-manipulated substitute for real faith and it may well abound when Christ returns. On the other hand, faith is the Holy Spirit living and acting in the hearts of the faithful, and that will be very rare when Christ returns, if it exists at all. And this is what Tom Lehrer’s song and John Lennon’s songs are about. We can see it very clearly in the present war in Syria, where ethnic groups hide behind their religious name tags. Daily we hear of Sunnis, Shiites, Alawites, Druze and Christians, all fighting and slaughtering one another. It is the same in Burma (Buddhists versus Muslims), in Northern Ireland (Protestants versus Catholics), in Nigeria (Muslims versus Christians), and in almost every other conflict in the world, present, past and future. So are Tom Lehrer, his follower John Lennon and the standard atheist, right when they imply that religion is the cause of war? Of course, they are not right. It is human evil that causes war, though very, very often it cloaks itself in ‘religion’ – but never in faith. Faith, the knowledge of spiritual reality (not institutionalised or nationalised ‘religion’), is the cause of peace, not of war. However, such subtlety is lost on the atheistic mass media, which always present human conflicts as caused by ‘religion’, despite all the obvious cases when it is caused by anti-religious atheists – like Napoleon, Lenin, Hitler, Stalin, Mao and any number of other tyrants. The mass media always present wars as ‘religious wars’, ‘wars about religion’, and not about ethnic identities fighting for wealth, territory, natural resources and power. And this is how, surely, the end will come. Some ‘great’ man will appear as a peacemaker and unite, i.e. destroy, all religions and settle in Jerusalem, not far from Syria, where deluded people will bow down before him and all his magic tricks and illusions. Peace will come for a short time – but at the cost of freedom, and Antichrist, the Grand Inquisitor, as Dostoyevsky foretold, will triumph from his throne. No religion, no heaven, no hell, just imagine – ‘it’s easy if you try’, ‘all the people living for today’. We have seen so many of Antichrist’s little forerunners, from Charlemagne to Napoleon, from Hitler and even the deluded imagination of John Lennon, that we know the story of the end. Let us then beware. This entry was posted in Atheism, The Future, The Middle East and tagged The End of the World on April 24, 2013 by Father Andrew. Near the city of Aleppo, armed terrorists have kidnapped the Antiochian Orthodox Metropolitan Boulos (Paul) al-Yazigi of Aleppo and Iskanderun and a Syriac Metropolitan Ibrahim. According to details relayed to the an-Nahar agency by concerned sources, Metropolitan Boulos was on the Turkish side of his archdiocese, which extends from Aleppo to Antakya (Antioch). Along the road on their return to Aleppo, an armed group stopped them before they could arrive in the city, murdering Metr Ibrahim’s deacon-driver and kidnapping the two metropolitans. The Orthodox metropolitan’s office relates that the two metropolitans were not injured. Metropolitan Boulos is the brother of Patriarch Youhanna (John) of Antioch (Damascus). Additional information came into an-Nahar indicating that the kidnappers include individuals from Chechnya. This event is a challenge to Western countries, especially the USA, Great Britain and France. In camps in Turkey and the Jordan they are training, financing and arming the Sunni Islamist terrorists of 22 different nations who are operating in the war against Syria. Now that the Patriarch’s brother has been kidnapped (and is probably being held to ransom), will the West retract its support for Al-Qaida terrorism and support the native Christians of the Middle East? Or will it do as in 1054, 1204, 1453 and on countless other occasions since, and once more betray the Church of God? This entry was posted in Islamic Persecution of Christianity, Islamist Winter, Syria, The Middle East and tagged Metropolitan Kidnapped on April 23, 2013 by Father Andrew. After a thousand years, Europe is ending. And where the old European culture is not ending, it has already ended. This is because Europe has stopped believing in its ethno-religious ideology which drove it to worldly ‘greatness’, to conquer the world, in crusades, in exploration, in exploitation, in wars, in empire-building, in invention, in colonisation. That ideology killed itself during and in the aftermath of two great European Wars, which Europe spread to its colonies worldwide and called World Wars. Europe’s ‘Scramble for Africa’ in the two generations before 1914 ‘worked’ because it used machine guns against spears and bows and arrows. But in Europe’s ‘Scramble for Europe’ in 1914, machine guns faced machine guns and so Europe slaughtered the flower of its own youth. It took America to end that slaughter. Ignoring its opportunity for repentance, Europe was not content with one slaughter, and so a generation later it began another slaughter, which was ended by an American invasion and occupation. Today’s Europe no longer believes in Something. Therefore it believes in Anything. It has sold its cultural birth-right to others, whom it invites to live in its midst. Its native birthrates are in permanent decline and the statistics would be declining even further if many European men were not marrying Eastern European and Asian women, who unlike many Westerners did not forget their instincts in the 1960s, in order to have children, and if many Muslims and Africans did not live and have large families in Europe. The seeds of Europe’s destruction were contained in its very ideology, which asserted that the European human-being is god. As a result, today Europe is itself being colonised – because others have simply imitated its ideology and asserted themselves and not Europeans, as gods, only more efficiently, more rationally, more logically. Already an American colony, is Europe now to become an Asian colony, as America, itself an imitation of Europe, in turn declines in bankruptcy? Where does Europe go from here? For fifty years Europe has imitated America, spoken like America, built like America, dressed like America, eaten like America, drunk like America, listened to America and watched American television. For fifty years Europe has lived on borrowed time. But now time has run out and so we speak of the end of its civilisation. But he who says that a civilisation is ending also says that now there is space for a new civilisation to begin. But which civilisation can this be? Surely not the old European paganism? Europe cannot go forwards to find a new civilisation. Therefore, it has to go backwards, not as far back as to its old paganism, but to that time when its now failed ideology of the fallen human spirit did not exist, that is, to a thousand and more years ago. That age still exists, for Europe is still haunted by that civilisation of its saints, which ended a thousand years ago. And it is this saint-haunted Europe, inspired by the Holy Spirit, which contains the key to the survival of Europe – because that Europe is its spiritual essence, its very soul. This entry was posted in Europe, Orthodox Restoration, The Future, The West and tagged europe on April 21, 2013 by Father Andrew. This is a little book, published in the USA, with just 28 pages. You might think it expensive, but it is not, because this is the most Orthodox book of this year. And it will make you weep. It tells the story of the Appearance of the Mother of God to four young Orthodox women in southern Poland in 1925. It is full of the most delightful, childlike pictures. The text also is ultra simple. But it is worth far more than all the learned tomes of ‘theology’ produced at universities and talks given at ‘conferences’. Unlike them, this book will not send you to sleep. This book is first of all a tribute to the Carpatho-Russian people of south-east Poland, known as ‘Lemkos’. It is a tribute to their suffering under the cruel Catholic Austro-Hungarian Empire, then under Fascist Poland that in turn was swept away by Nazi Germany and Soviet Communism. It therefore has a universal significance for all real Orthodox, because we all face the same devilish, this-worldly tribulations to survive anywhere, especially those of us who have been called to live in the Western world. As the gifted author, who writes from the heart, says: ‘The Latin literacy of the West gave birth to a church rich in learning, piety and art. However, our mostly illiterate Eastern Orthodox ancestors painted, sang and acted out the Gospel, weaving it through a rich, liturgical cycle, wrapping it in a vibrant folk culture and celebrating it in their amazing churches. Our faith more than anything else is the mark of our people’. ‘Our compassion embraces you. Here I will make a home among you. Here I will be one of you and you shall be mine. Ahead lay rivers of tears and valleys of pain. You shall tread the edge of the abyss of despair, but here a spring shall flow, to nurture your return to the love and beauty that is your heritage and destiny’. This entry was posted in Carpatho-Russia, Orthodox Life, Orthodoxy, Persecution, The World and tagged Appearance of the Mother of God, Lemkos on April 19, 2013 by Father Andrew. The Boer War (1899-1902), in which the British Establishment killed over 20,000 white South Africans, mainly women and children, in concentration camps, was condemned in England by patriotic thinkers and writers such as G.K. Chesterton. Such freedom-lovers were condemned as ‘Little Englanders’ by jingoistic British imperialists like Rhodes and the press barons and arms merchants (often one and the same) of the time. However, lovers of the real England, under the boot of the Imperialist British Establishment, were far from being ‘Little Englanders’, for they enjoyed international support. Indeed, the war was condemned in the USA, France, Germany and many other countries, perhaps nowhere more than in Russia. Tsar Nicholas II, like his father Alexander III before him, found Western colonialism abhorrent, and supported freedom from colonialism in Thailand and Tibet, also supporting the cause of freedom of the Sikh leader Maharajah Duleep Singh in India, as well as in Africa. Now comes news that the 225 Russian volunteers who perished fighting against oppression in the Boer War are being commemorated. A few days ago in South Africa, Archbishop Damascene of Johannesburg and Pretoria laid the foundations of a church dedicated to St Vladimir in their memory. The ceremony was attended by the ambassadors of the Russian Federation, the Ukraine, Belarus, Serbia, Greece and Cyprus as well as local Russian Orthodox parishioners. They remembered in particular Eugene Maximov, who was awarded the rank of general in the Boer Army. This entry was posted in Imperialism, South Africa and tagged Boer War on April 17, 2013 by Father Andrew.